Still found in gentlemen’s clubs and those seaside resorts popular with the retiring middle classes. Because Barber’s shop used to be a men-only place it was the main retail outlet for the London Rubber Company, whose population-preventing products were known as ‘Something for the weekend, sir?’. Even when Boots the Chemist decided to overturn its founder’s ruling and sell these symbols of decadence and sin, for years most chaps on a promise would still rather buy them from Barber, a fellow man, than from a rosy-cheeked Boots Saturday girl or a fierce-looking lady pharmacist. Of course, this was in the days before condoms for £1 in pub toilets, before they had more flavours than an American ice-cream parlour, and before the sexual revolution (circa 1965) when the proposal to install a contraceptive vending machine in the students’ union at Leeds University was front page news in the Daily Mirror. Ah well, the swinging, up-and-down adjustable leather chairs are gone and the glass cabinet no longer contains brilliantine, macassar oil and packets of Blue Gillette. The indicative sound is no longer the snip-snip of super-sharp scissors or the fine scrape of the cut-throat razor slipping through the foam, because an entirely new, loud and abrasive noise has taken over, made by something you would never, ever have seen in any proper Barber’s shop, not ever, ever, ever: a hairdrier. Hairless Shortback, often visually impaired, can only do one style of haircut although he asks you how you would like it cut (answer: in complete silence). Flowery Limpwrist is a newish variety which may outlast the others. He cannot do any style of haircut at all but takes endless trouble and vast quantities of your time to wash, cut, blow-dry, primp and spray your hair until you look like Best of Breed at the sheep show. Sylvia Uniform wears smartly pressed trousers (possibly pin-striped), a crisp white shirt and the kind of black tie favoured by saloon card-sharps in Western films. She deals with her male customers in the same way that a fishmonger deals with a haddock. She may levy fines for portable-telephone interruptions. Quid pro quo for the paying male victim is the luxurious maternal depth of cushioning bosom at certain points in the procedure. This is almost the last of the characters from the book that I will be featuring, it’s time for something a little different. Words as per usual are here by Gordon Thorburn and image by myself. I hope you have enjoyed these as much as I enjoyed drawing them, the final one will be the last one from the book and will be published in due course. 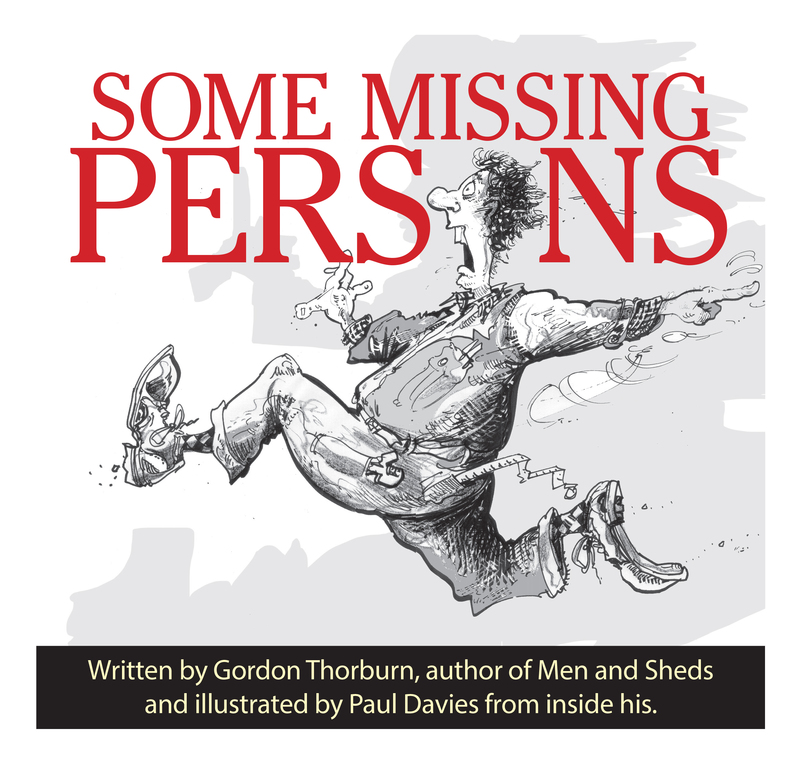 Very entertaining post and I absolutely ADORE that running fellow for “Some missing persons” – he’s making me laugh out loud!!! The running chap was actually used originally in a campaign for on-site safety and was an indication of what not to do in case of fire. We have one or two around here too, one in Stroud used to have signed photographs of the ‘stars’ like Elvis and claimed to have cut his hair. All the signatures had a similar ‘feel’.This chap is based on the look of the two blokes who came into Hutton Grammar School to scalp us boarders, all 60 or so of us would emerge with the same short back and sides.I still shudder to think about it.